The other day I was talking about how you can merge several GeoPackages files in a single GeoPackage —just because you wanted or needed that way. Problem is, sometimes some of the data or information that those GeoPackages contain could be redundan. In my particular case, some information was redundan because the GeoPackages contain forest data at stand level that is also at UTM10 Finnish’s grid1 level. Since life is imperfect, some stands are between two grid quadrants, so a decision2 was made to have them in both —or more3— of the quadrants. So we needed to remove those duplicated stand, among other things to leave the GeoPackage ready to be analyzed in R. Most of the scripts we used are in the GeoProcessing tools from the Vector menu in QGIS3. First of all, we need to remove the duplicate stands from our data. This can be performed with the dissolve script where the standid was used as a Unique ID field. As I told you, there are stands that overflow the grid representing our area of interest. In the previous step we just removed the duplicated stands, but the stands in the outside border of the area of interest weren’t duplicated but part of them were outside, as you can see in the left image. 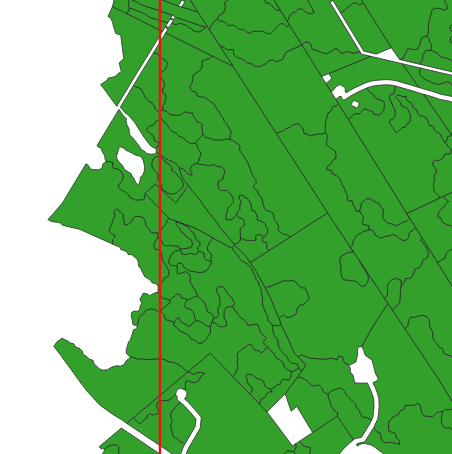 Since we just want the forest area inside of the grid we have to clip those stands using the grid. Now, we have a perfect straight borders. After the intersection was performed, the resulting layer is going to have the information from both intersected layers. In other words, each of the stands have a column now where is stated to witch quadrant of the grid belongs. After the intersection with the the grid the areas of the border stands needed to be updated, they aren’t the same any longer since they’ve been divided. 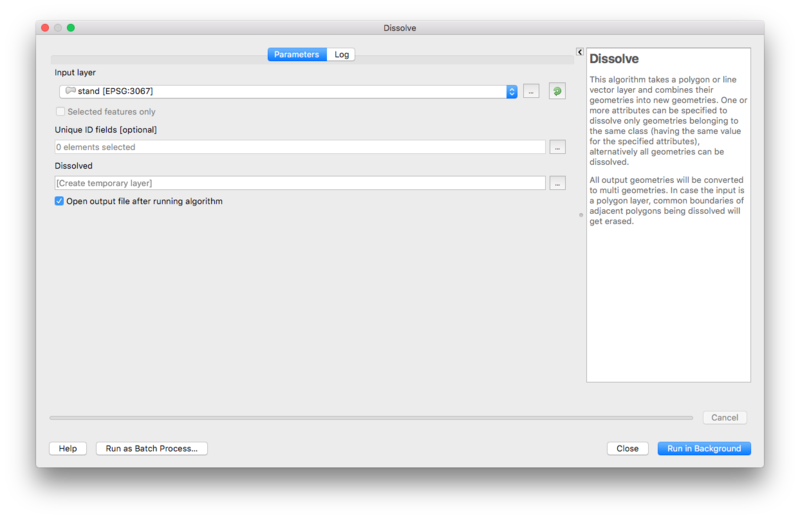 To do so we can use the QGIS field calculator. We created a new field and used the formula area($geometry)/10000 to fill it and divided the result by 10000 to get the result in hectares. 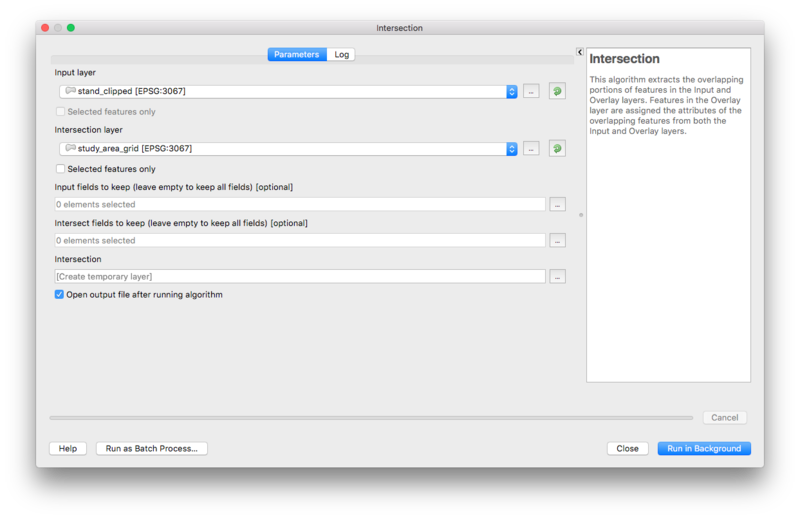 You can know more about this functions from the QGIS3 help. For the area function. Returns the area of a geometry polygon object. Calculations are always planimetric in the Spatial Reference System (SRS) of this geometry, and the units of the returned area will match the units for the SRS. This differs from the calculations performed by the $area function, which will perform ellipsoidal calculations based on the project’s ellipsoid and area unit settings. And for the $geometry function. Returns the geometry of the current feature. Can be used for processing with other functions. After the intersection and the creation of the updated area field, a little bit of housekeeping was needed —in my opinion— in the final layer. It’s always good to keep layers tidy and with just the information you need. Too much information that you don’t need just create clutter, which make difficult to read the useful info. 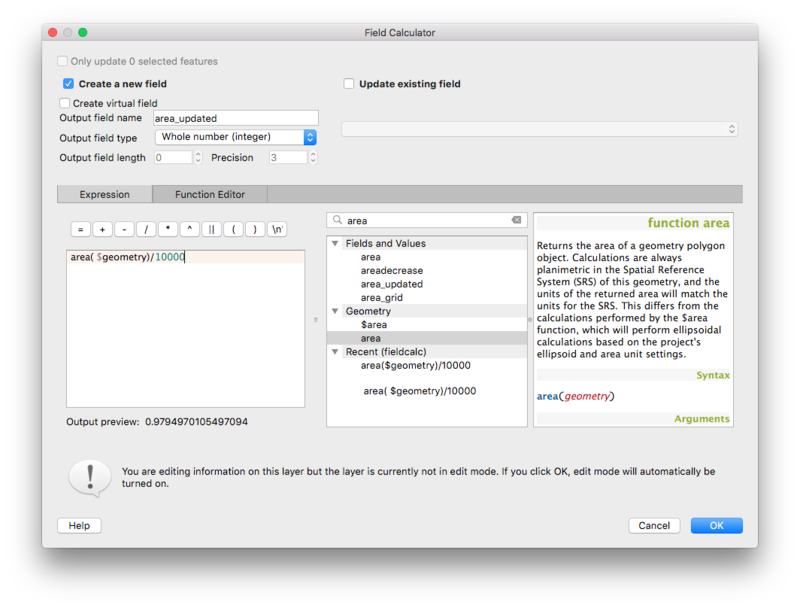 To tidy up the layer we used the Refractors fields script on the QGIS Vector Layer toolbox. In these GeoPackages there are additional info that it’s contained in the adjoined tables. Some of that info it’s going to be also duplicated, but you can’t —or at least I don’t know how— clean that duplicated info in QGIS3. I couldn’t find any script to remove duplicate entries in a table. All these info it’s going to be used in R to perform analysis, so it’s probably must more easier to clean those tables there with something like this. This leads us the last step. This was the last step, but to know more about this you can check Olalla’s post.